Reviews of the Nikon Coolpix AW110 from around the web. Nikon is a relatively new entrant into the world of underwater/rugged cameras much like its arch rival, Canon. Its original model, the AW100, was announced in Fall of 2011, and then replaced in January 2013 by the Coolpix AW110. 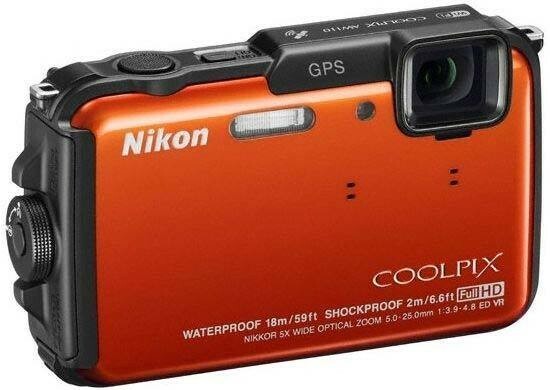 The Nikon Coolpix AW110 was announced in January 2013 and is an update to Nikon's first all weather camera, the AW100. It is now waterproof to an impressive 18m. You can buy the AW110 in blue, black, camouflage and orange for £270. The AW110 is Nikon's second foray into the tough compact area of the market and follows on from the AW100. Mimicking the styling of its predecessor, it adopts many features and connectivity functions from Nikon's Coolpix range, and it's one of very few waterproof compacts to offer built-in Wi-fi functionality, which can be used in connection with Nikon's Wireless Mobile Adaptor app (iOS and Android compatible) to transfer images directly from the camera to a mobile device or control the camera remotely.